Total sensory overload. 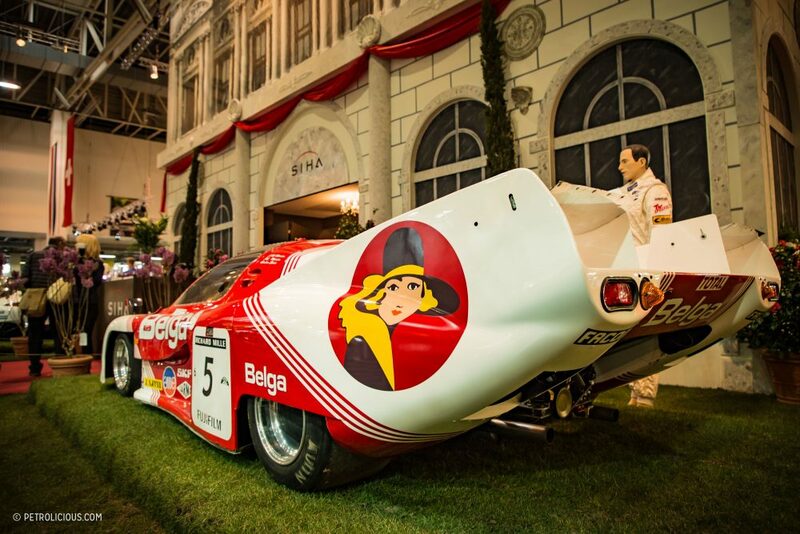 That’s how I’d describe Techno-Classica’s 120,000 square meters of floor space spread out over 21 halls. 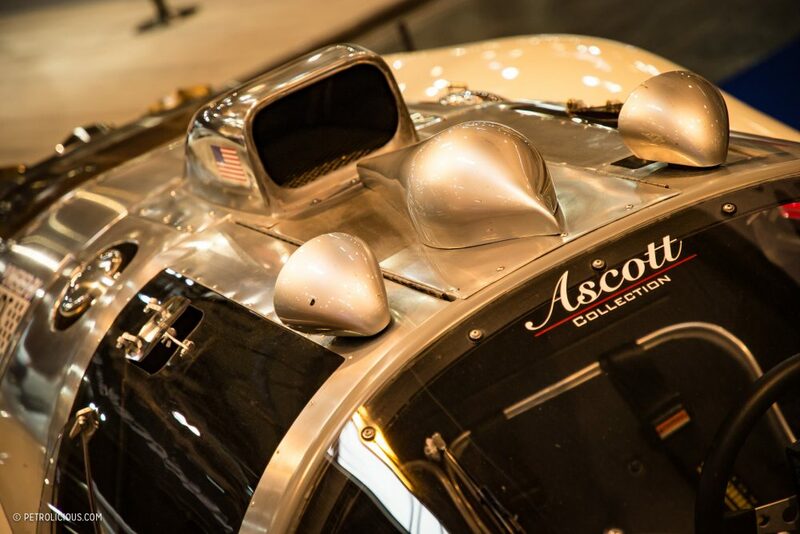 With 1,200 exhibitors and 2,700 cars for sale, it’s a massive extravaganza of all things old and shiny, to put it lightly. 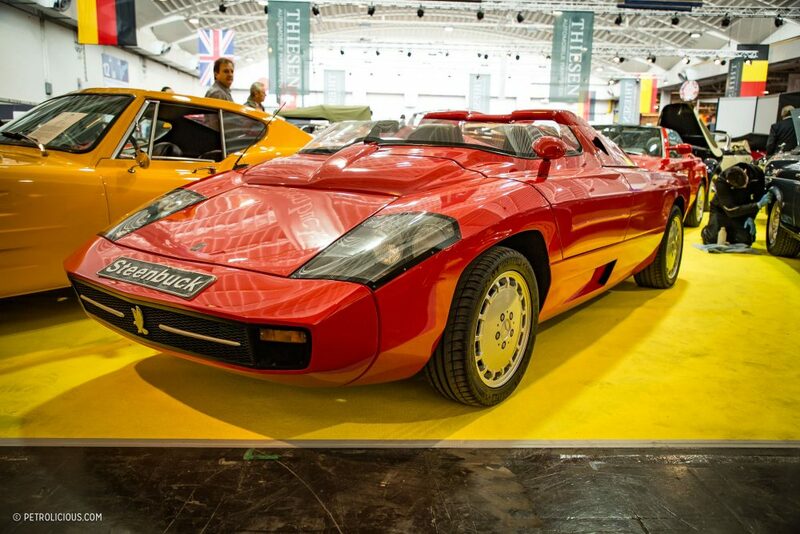 From the Lancia S4 Stradale by the door to the Bentley prototype and Isderas in the back rooms, to the modified Porsche creations from the likes of DP Motorsport, to the distinctive papaya orange glow of a Can-Am McLaren, there was a little bit of everything at this year’s event in Essen, Germany. 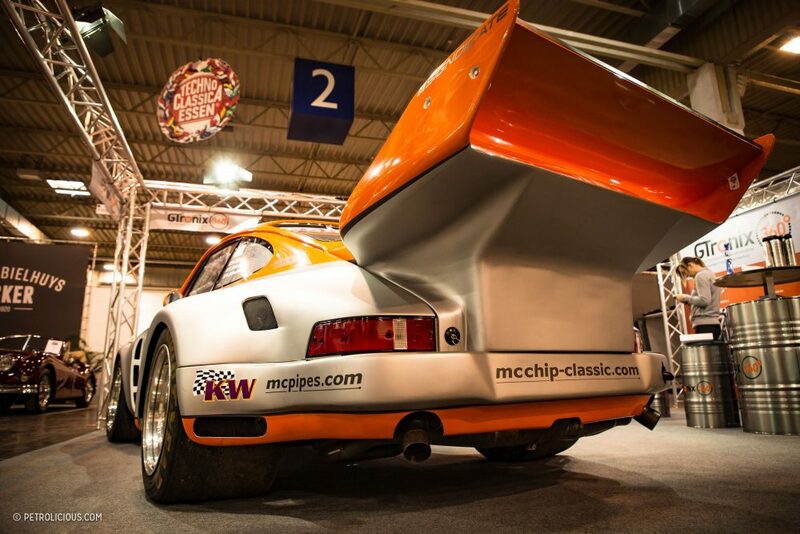 So, I put on my hiking boots on and spent a few days seeking out the show’s highlights, with a special focus on the competition cars. Let’s dig in. Whenever I see an M1 a smile with a bit of added sadness, but as you’ll see, it’s especially true in the case of this car. 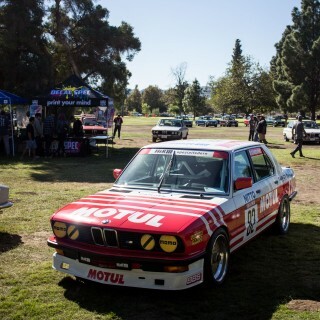 So the M1 in general then; what do you do if you’ve built a race car but can’t compete with it? 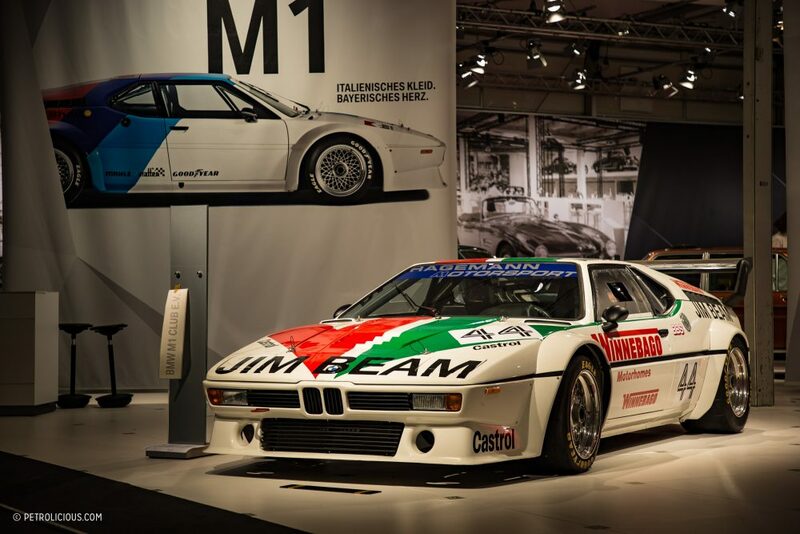 BMW and Bernie Ecclestone decided they could make their own series instead, and that’s how we got the M1 ProCars like the one here. 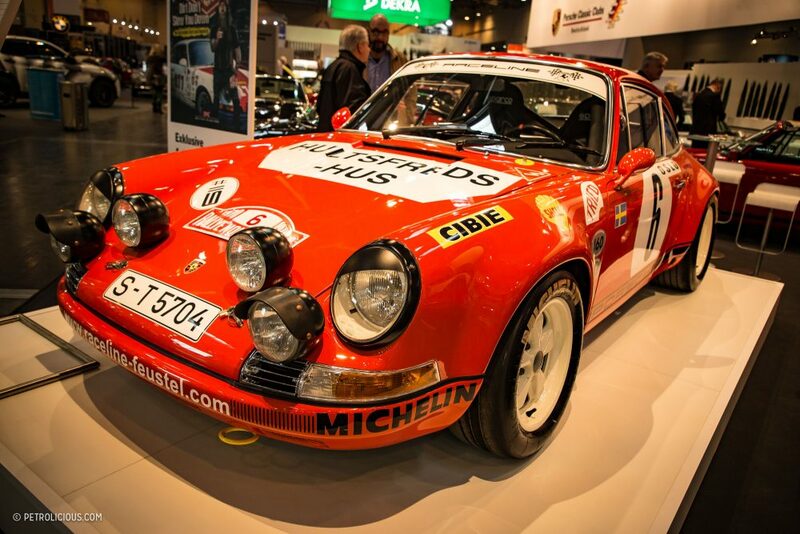 Piloted in Group 4 spec by some of the day’s best drivers, the series ran predominantly on the F1 schedule and many raced in both, like Niki Lauda. 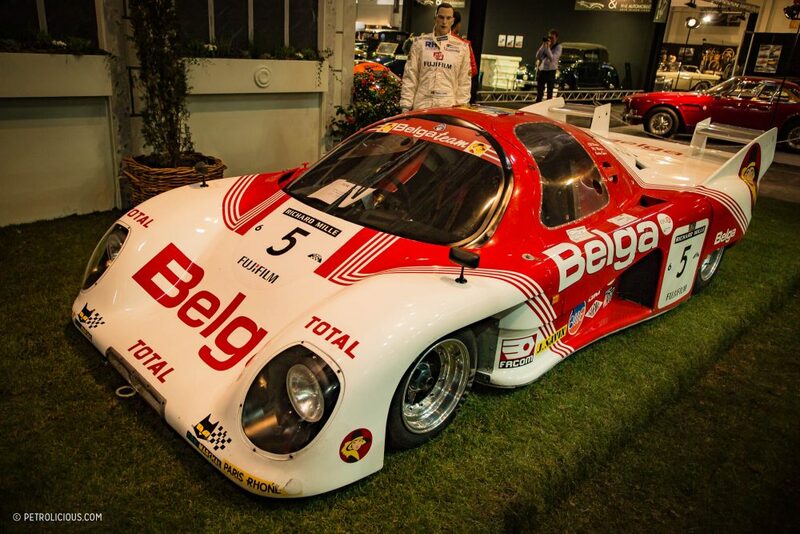 This car was the 4th place finisher in the 1979 season, and in the GS-Tuning, Jim Beam sponsored car was 23-year-old Marcus Höttinger, who was destined for F1 himself at one point. Unfortunately he was killed the next year in an F2 race, a day before he was due to be announced as an F1 driver. 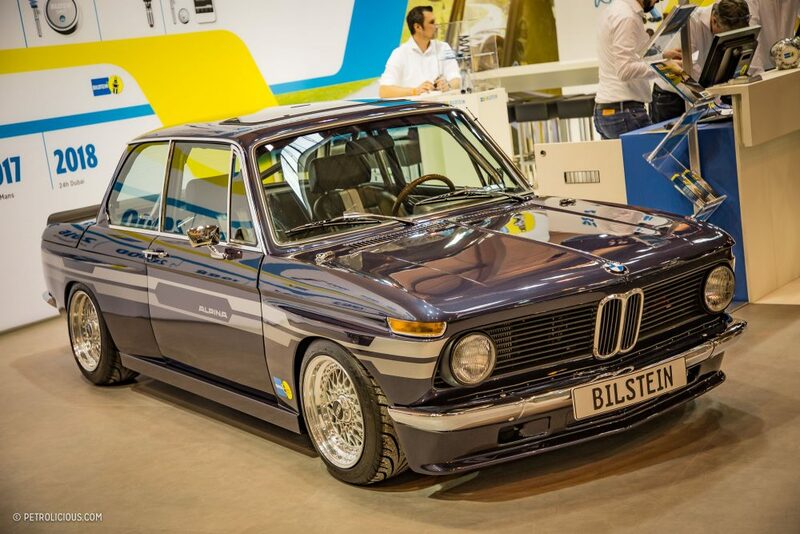 Next to that car on the BMW stand was the glorious 1976 ETCC championship-winning car. 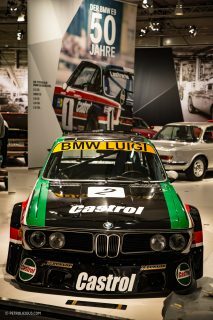 The Team Luigi-run CSL driven by Jean Xhenceval and Pierre Dieudonné was running only a 3.1L engine to conform to Group 2 rules rather than the 3.5L its cousins ran elsewhere. 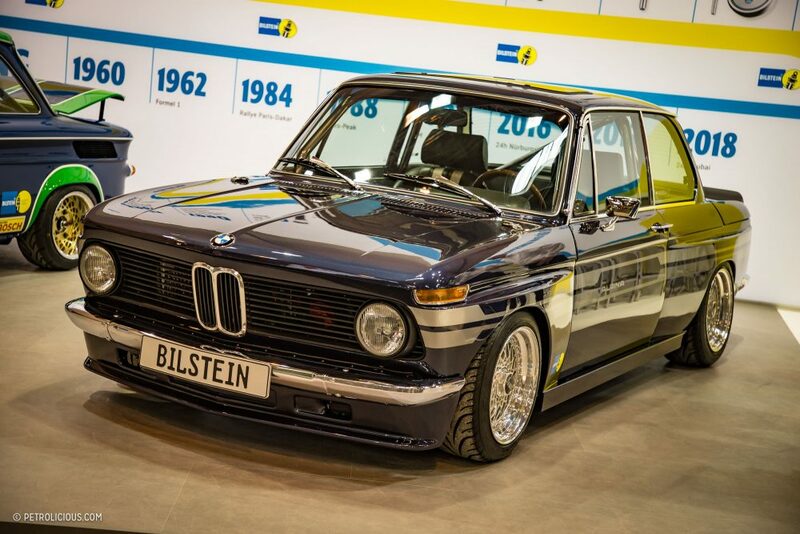 Another stunning Bavarian beauty that stopped me in my tracks was this rather aggressive 2002 wearing Alpina stripes at the Bilstein display. Apparently they put some special suspension on it, but unfortunately that was all anyone could tell me, seeing as the owner was likely lost in one of the many places to do so at this show. 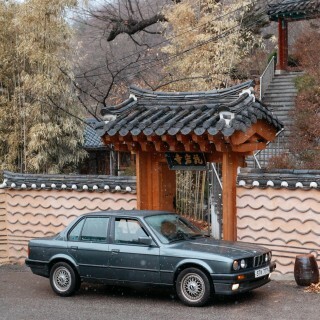 This is one car I will be looking into soon though. 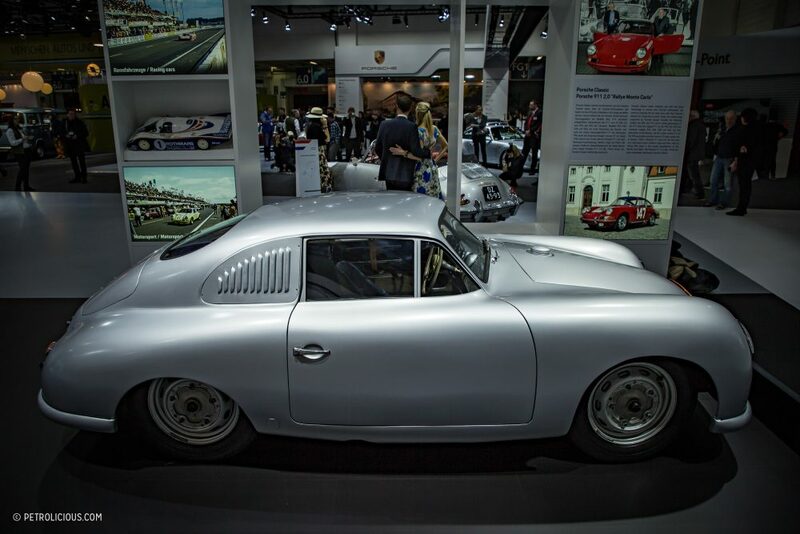 No classic car show is complete without Porsche of course, and their classic department had a corner of a hall all to themselves. 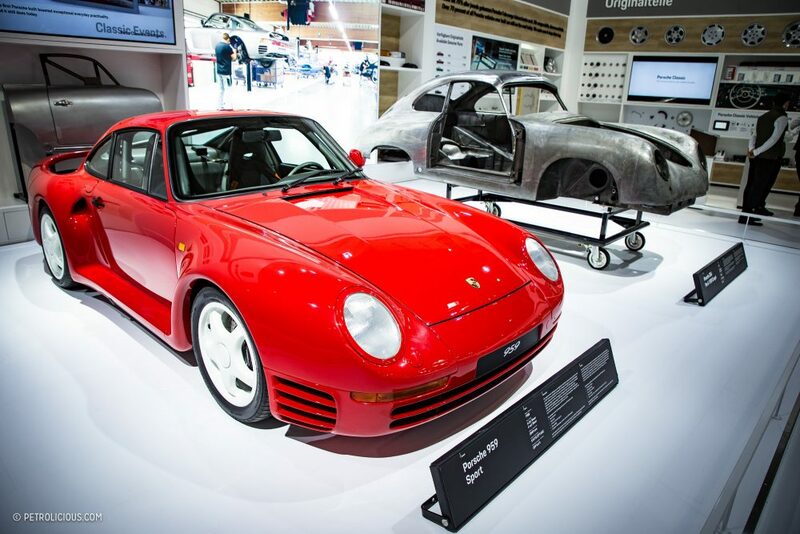 A gorgeous 959 Sport, one of the most sought after models if you ask me, was parked next to an in-progress restoration being carried out on an early Pre-A. 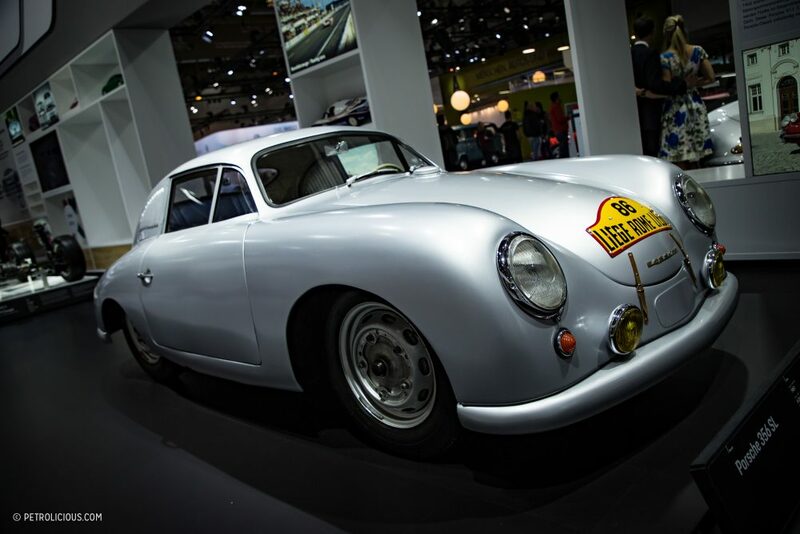 The 356 SL Coupe with the Liege-Rome-Liege history was also there, proving that one of the first class wins Porsche ever took was also gorgeous. 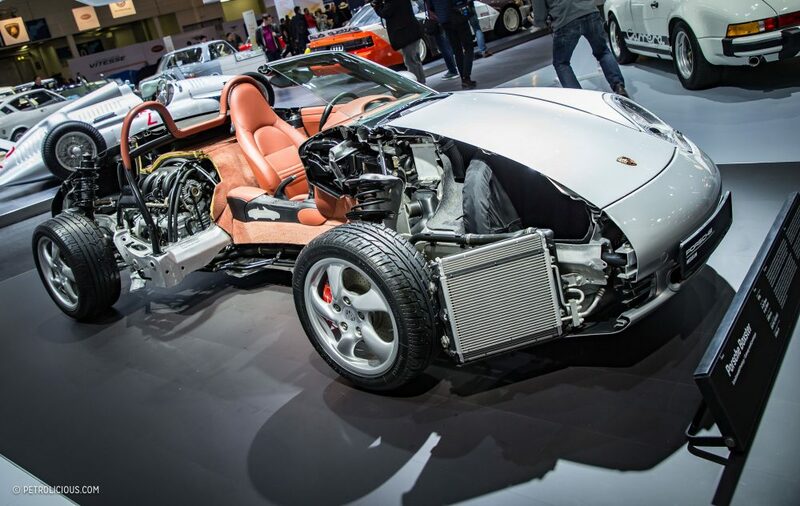 Without an accident or doing something drastic with an angle grinder, there’s no way of seeing what lies under the skin of my Porsche Boxster, however this full-size cutaway was a handy way of seeing what lies beneath. 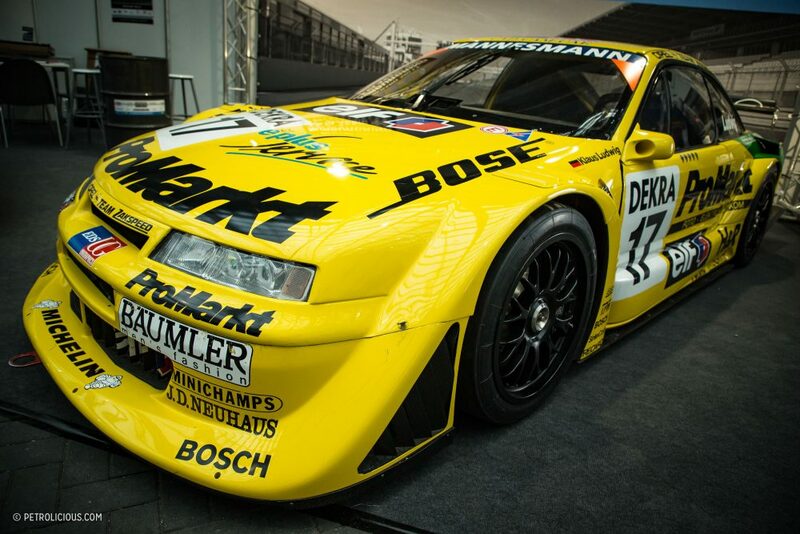 Next door was sister VAG company Audi with a stunning Trans-Am 200 Quattro. 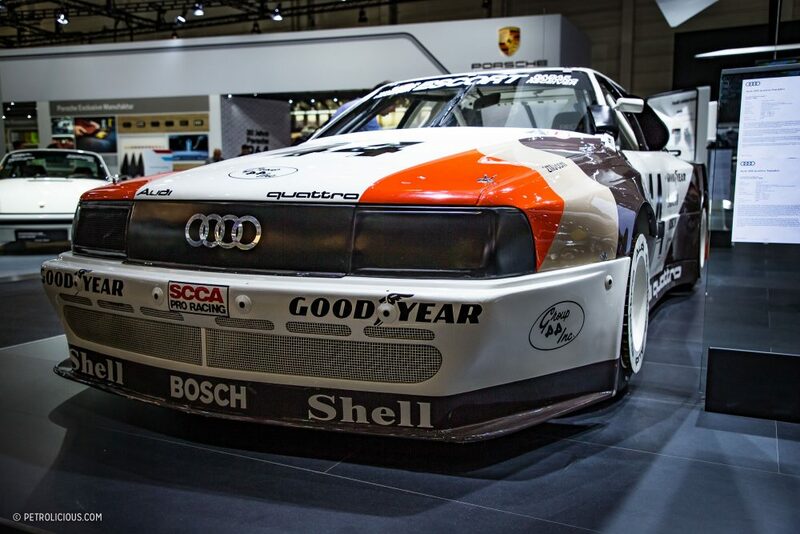 The 550bhp, 1200kg car had Audi stalwartsHans-Joachim Stuck and double WRC champion Walter Röhrl behind the wheel in 1988, but it was the third driver, the American Hurley Haywood, who would take that year’s title. 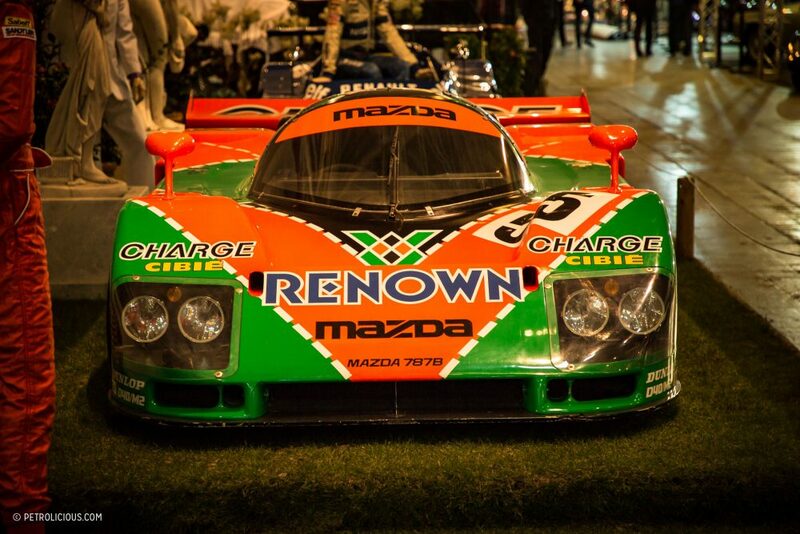 This car absolutely dominated the series. 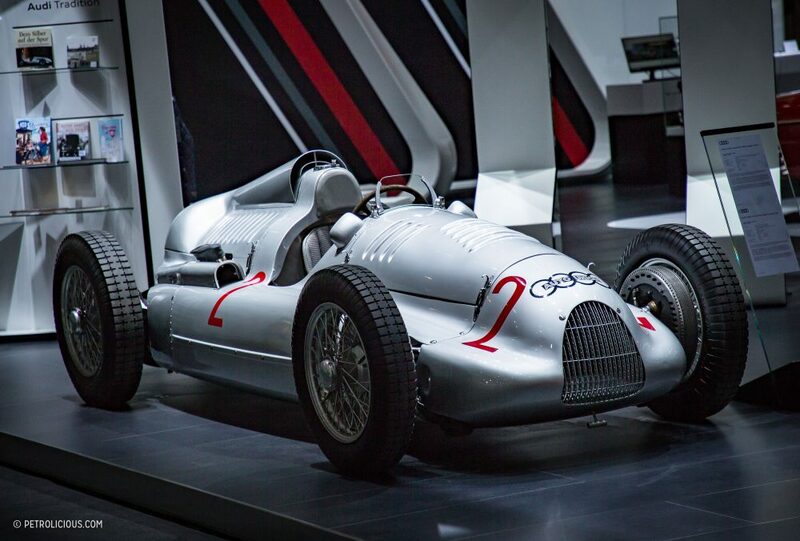 Behind it on the display was the 1939 Auto Union, Type D. A mid-engine layout with torsion bar suspension, it followed the previous year’s Type C that was designed by a certain German named Ferdinand. 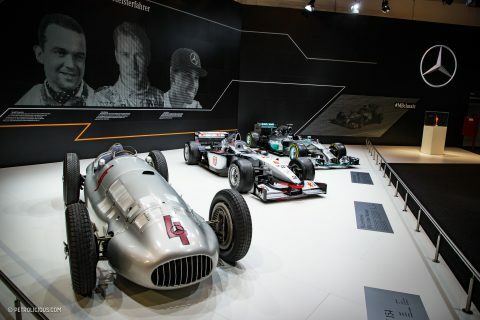 One of the drivers in 1939 car below was Hans Stuck, the father of the Hans Stuck of the car above. VW didn’t miss out on their competition credentials either. 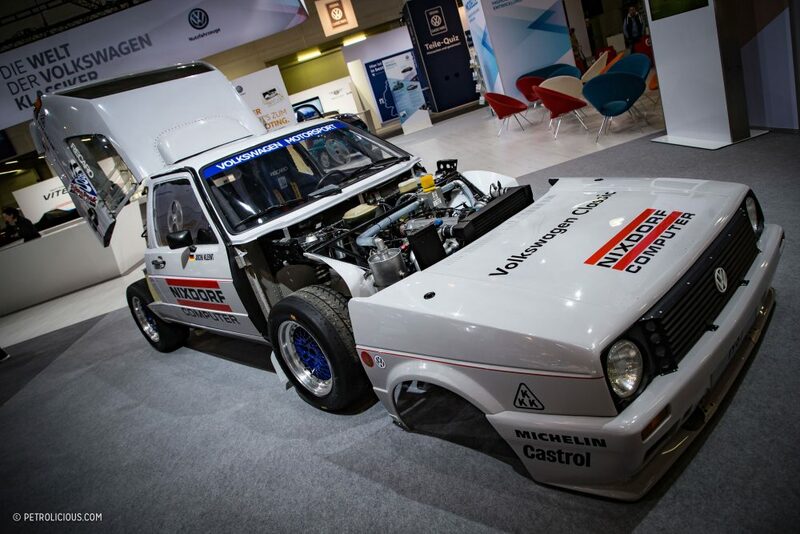 A few days after the press release of their all-electric ID-R for this year’s Pikes Peak Hillclimb, they displayed one of their previous challengers for the famous course, the bi-engined Golf… which was a lot more competitive than it might seem! 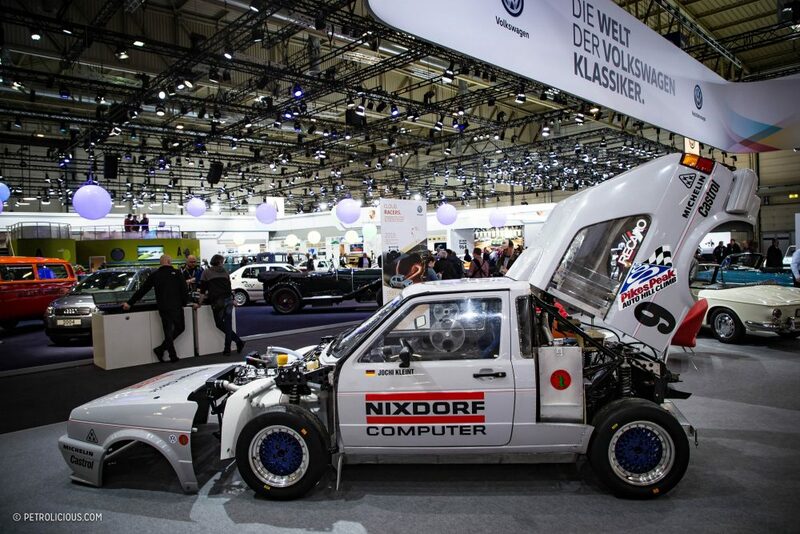 The first attempt with two 1.3L Polo engines made 500bhp, and driver Jochi Kleint finished 4th overall. This result prompted a bigger effort with a new car for 1987. 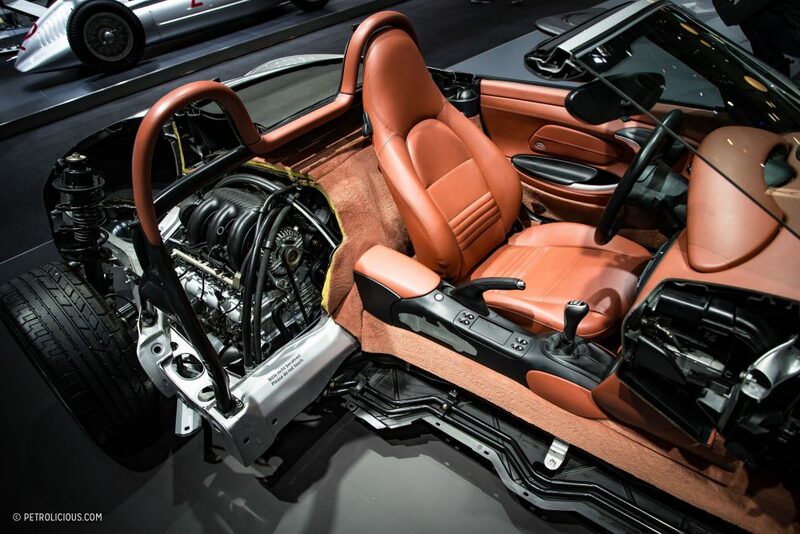 This meant two 1.8L 16-valve units were installed, and the 1050kg car put out 652bhp. This was the year when Walter Röhrl went up in the S1 E2 Quattro, and Audi history would have you thinking that there was no one else in the event. 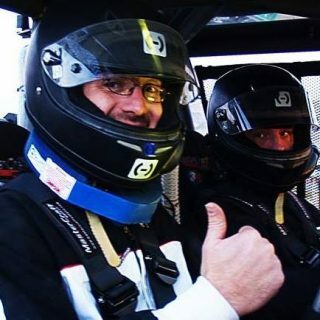 In reality, Kleint was leading in the first split before the car’s front suspension gave way heartbreakingly close to the finish. 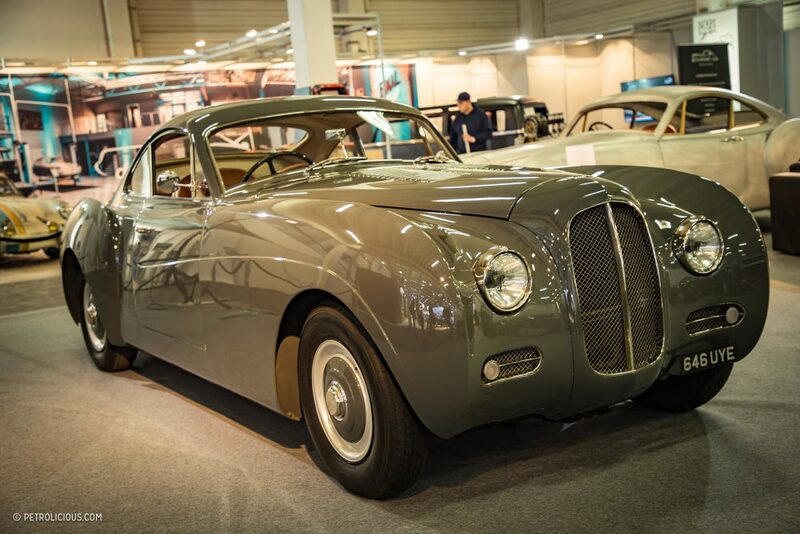 The car pictured below doesn’t look like any 1950s Bentley I know and there’s a reason for that. 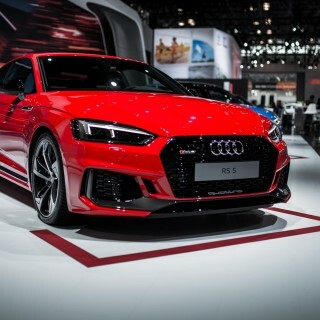 It’s a re-imagining of what the racing Type-R may have looked like, and with hints of Jaguar and Aston Martin thrown in, the Bensport-built car is a real head turner. 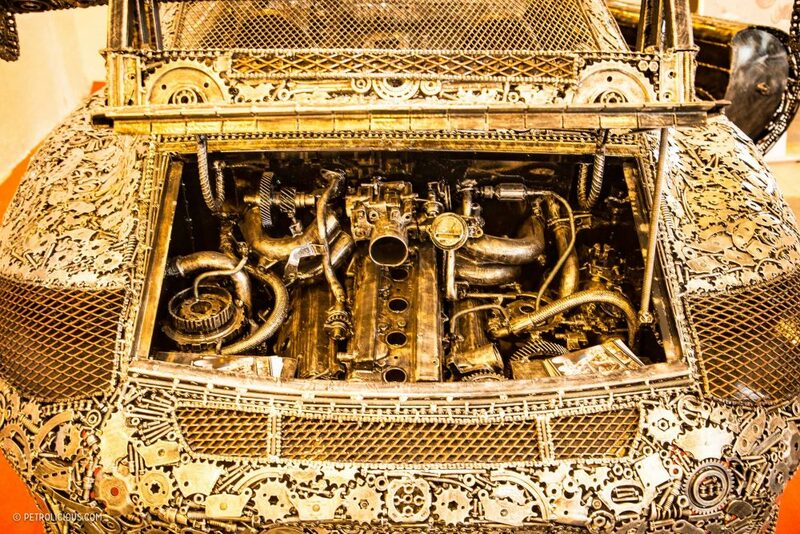 Underneath, it’s an original but refurbished Bentley chassis, and engine. Unique and gorgeous. And very expensive. 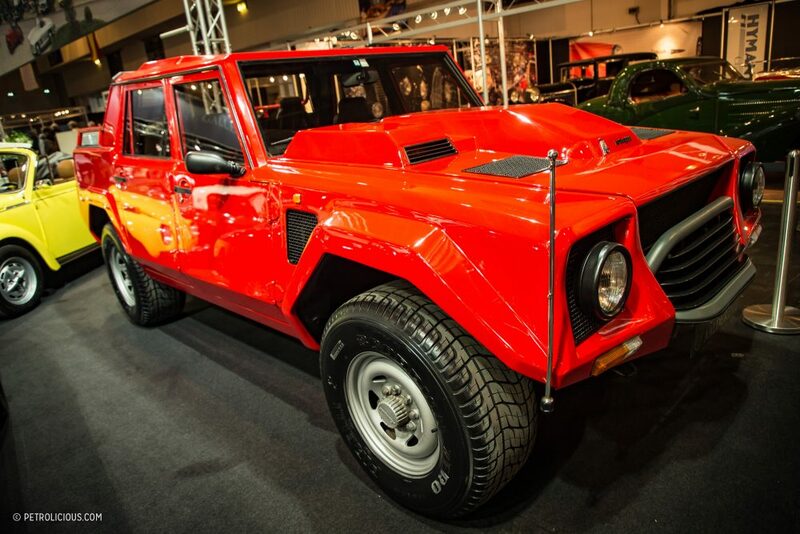 Almost a full generation before other car manufacturers started making their rapid SUVs, Lamborghini came out with this beautiful monster, the LM002. It’s actually the first one I have ever seen in the flesh, somehow. Presence of a true beast. 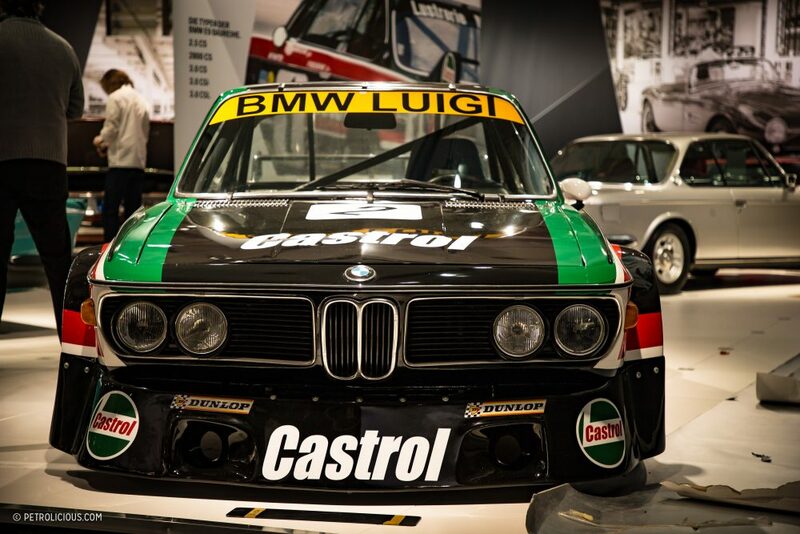 An original JLP racing 935 was another favorite. 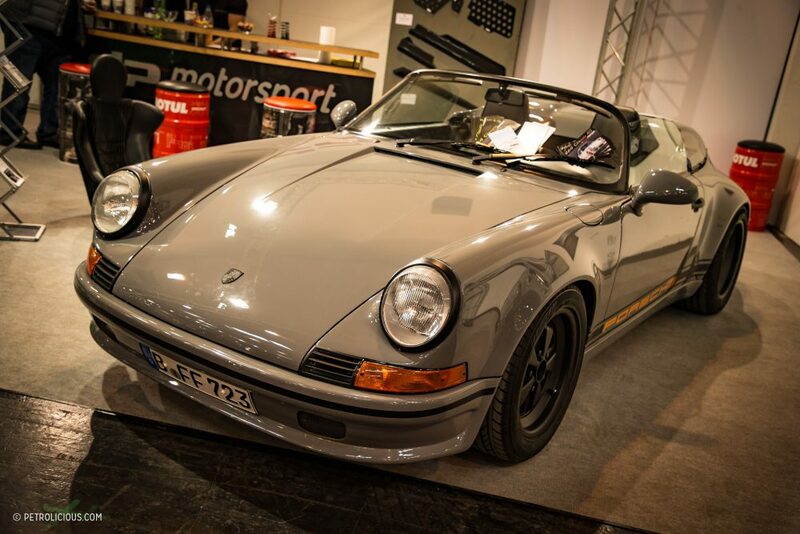 Ekkehard Zimmermann of DP Motorsport created what is arguably the ultimate 911 racing body for the Kremer Racing K series of cars, and JLP bought a few like this K3, in addition to building some of their own pieces. 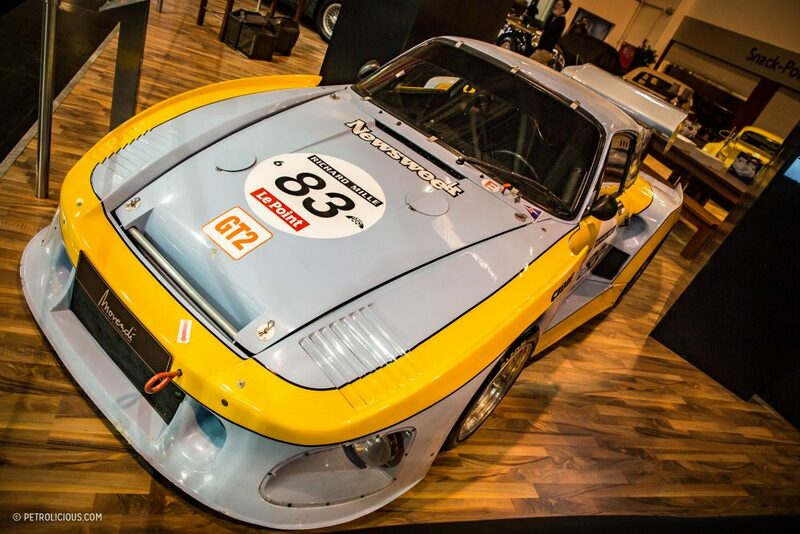 The dodgy dealings of the father and son John Paul Sr. and Jr. are worth a Google search, and this 935 is one of the most original remaining today simply because it spent many years in a police garage while they were being prosecuted for a massive marijuana smuggling operation. 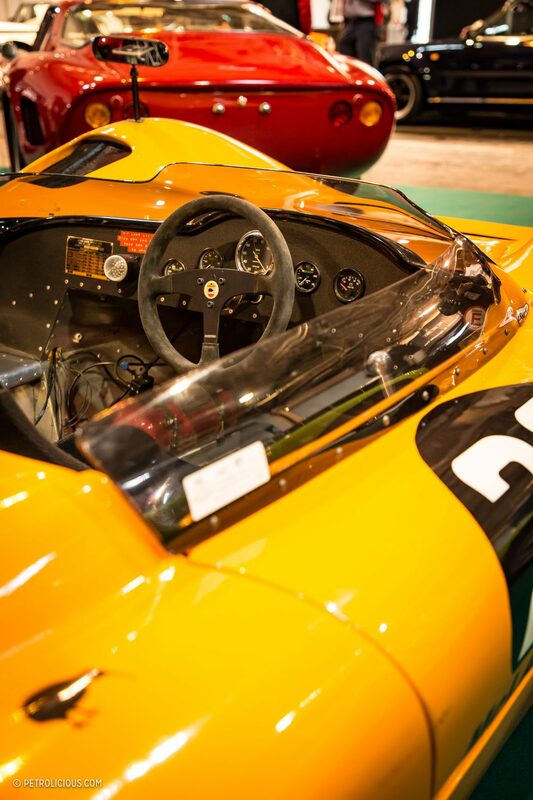 A stunning display of former Le Mans cars adorned the center of the biggest hall. 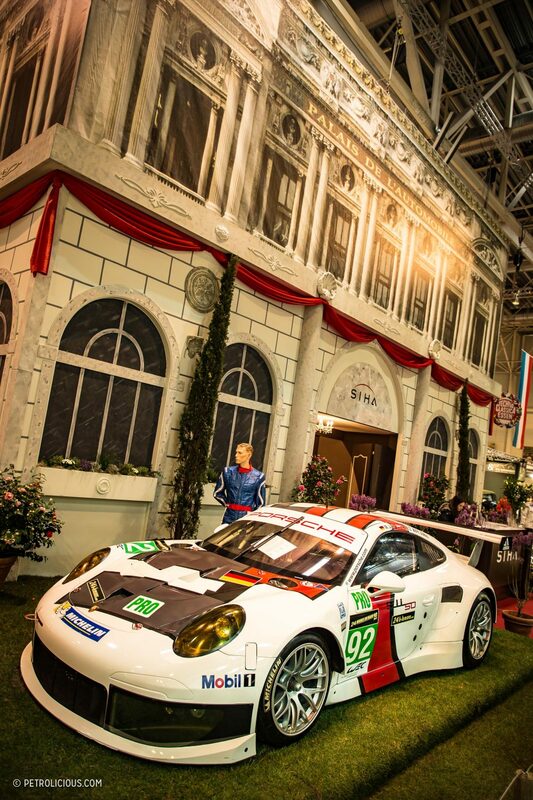 The 2013 works team LM GTE Pro class-winning 911 RSR of Marc Lieb, Richard Lietz, and Romain Dumas might seem a little out of place in a classic car show seeing as it’s only a few years old, but it’s a 911 though, and a Porsche with successful Le Mans history is always going to be a special piece of their history. 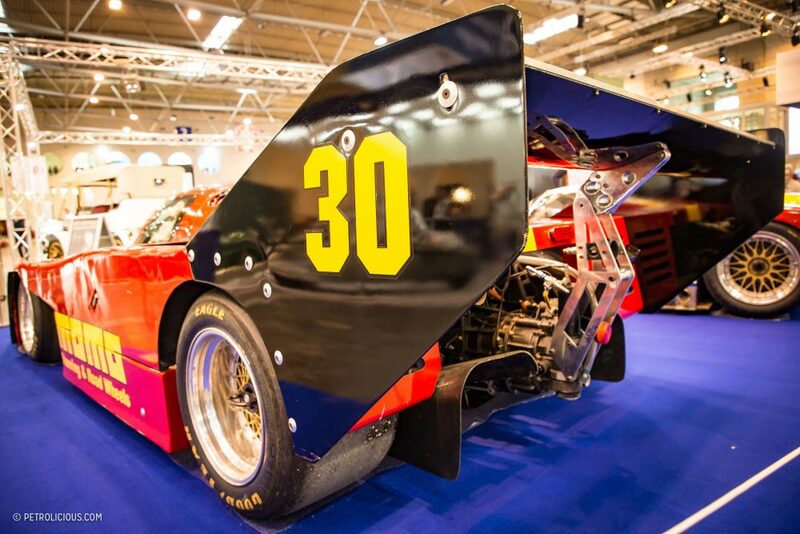 The beautifully curved Belga-liveried Rondeau above has a strange claim to fame: it’s actually credited as being the car that started more races at Le Mans than any other in history. 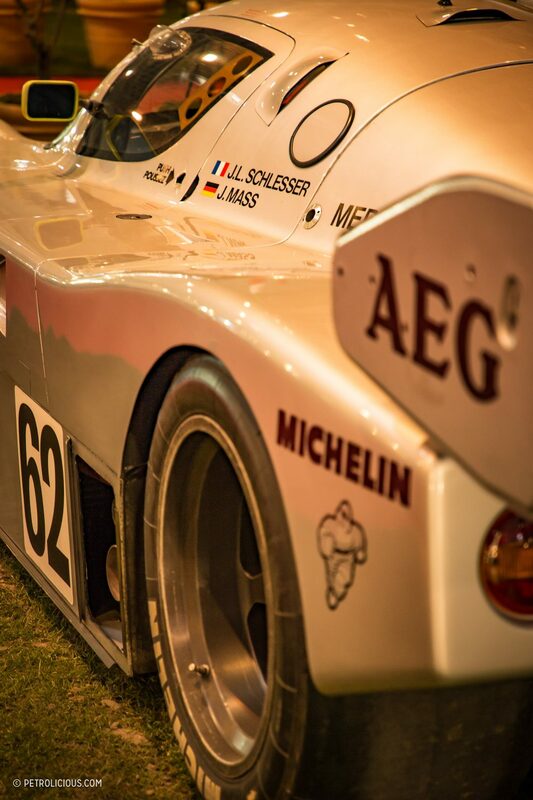 It took ten starts between 1978 and 1988, with its best result a 2nd in 1981 behind the race-winning works Porsche 956. The legendary Mazda 787B, winner of the 1991 event, sounds even better than it looks though couldn’t be fired up indoors obviously, and around the corner was the stunning Sauber Mercedes C9 of Jean-Louis Schlesser and Jochen Mass that won the 1989 World Sportscar Championship. 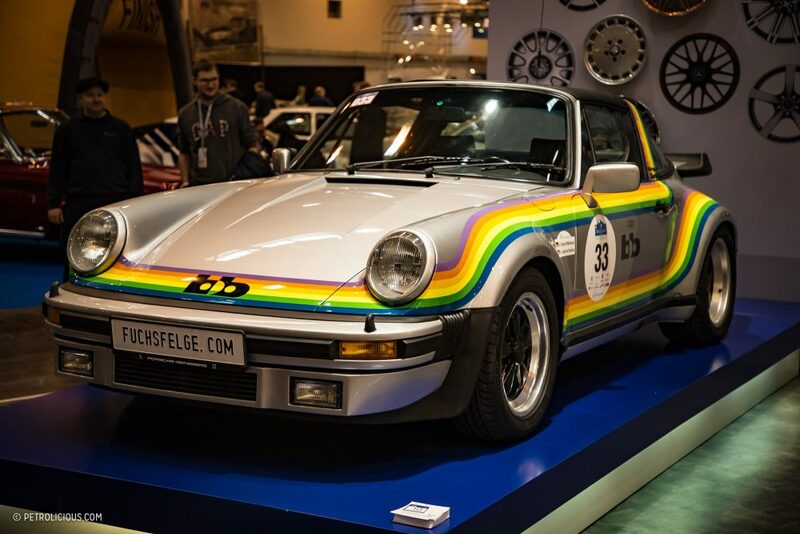 When can a car that is not a Porsche, be as cool as a Porsche? 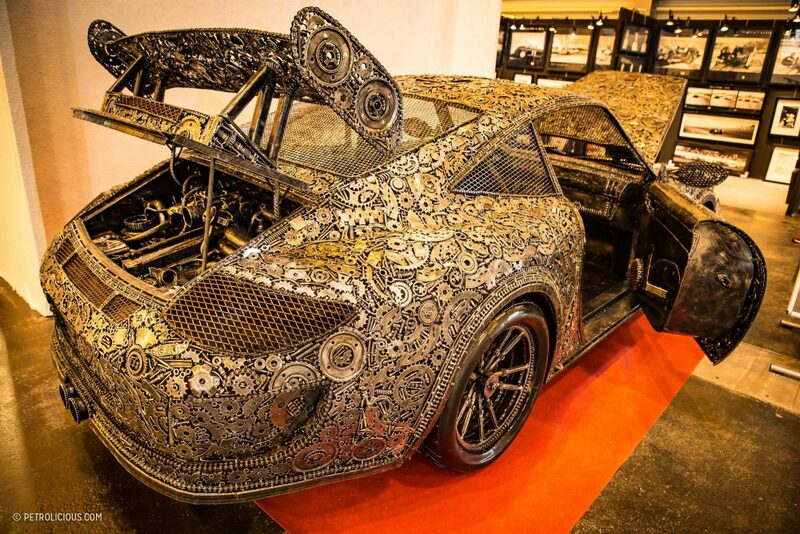 When it’s made entirely from scrap machine parts! 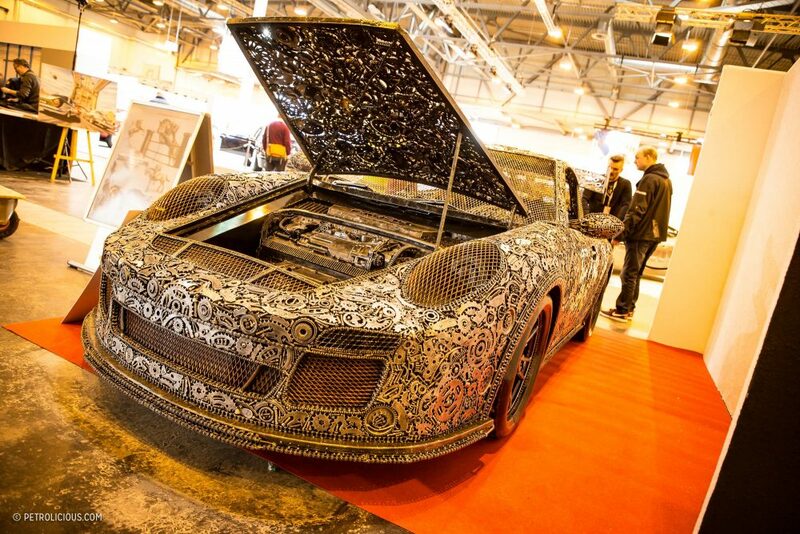 I think I stopped longer looking at this car than anything else in the show, but I can only imagine how long it must have taken to construct this work of art. 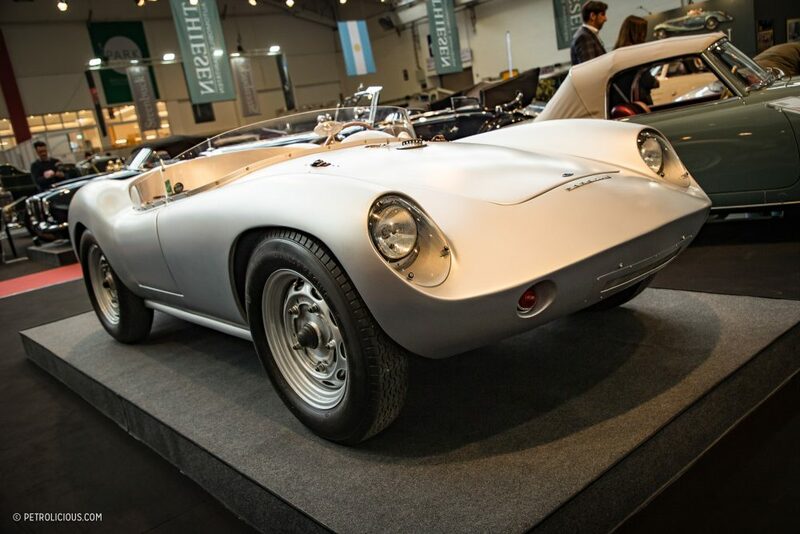 This next car has a Porsche badge on it but it’s actually a 1959 Devin D. Porsches were always expensive cars, so a budget solution thought up by an SCCA racer named Bill Devin was to use a Porsche engine, VW parts, and a lightweight self-designed body. 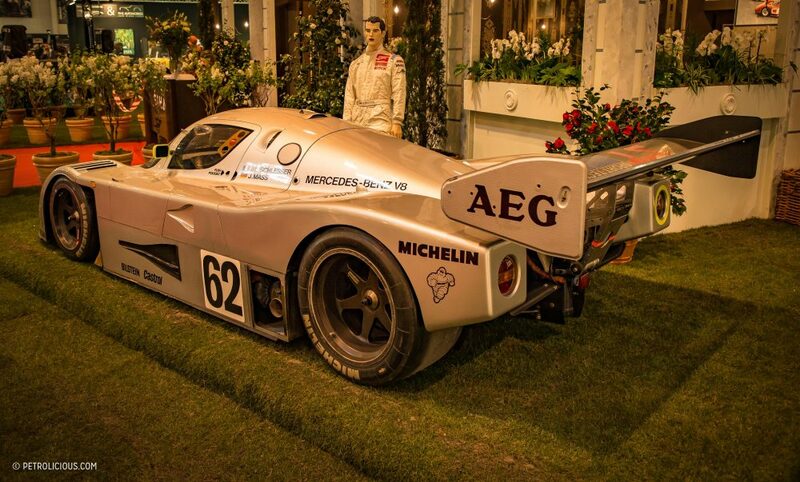 It’s a beautiful and historic car but despite what the badge says, it’s still not a Porsche! 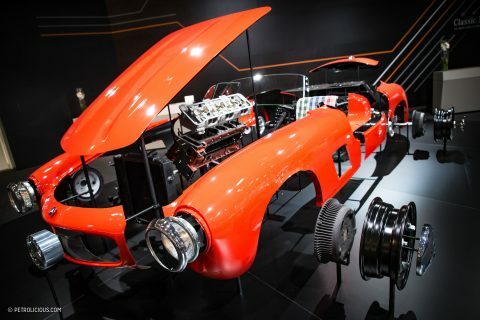 Some things Eberhard Schulz designed under his Isdera brand were absolutely gorgeous. Others… not so much. 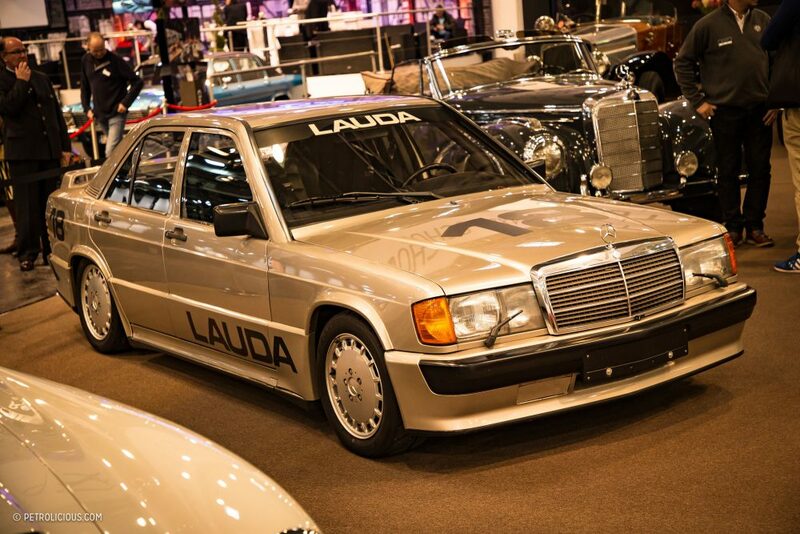 Klaus Ludwig drove many cars over his long and distinguished career. 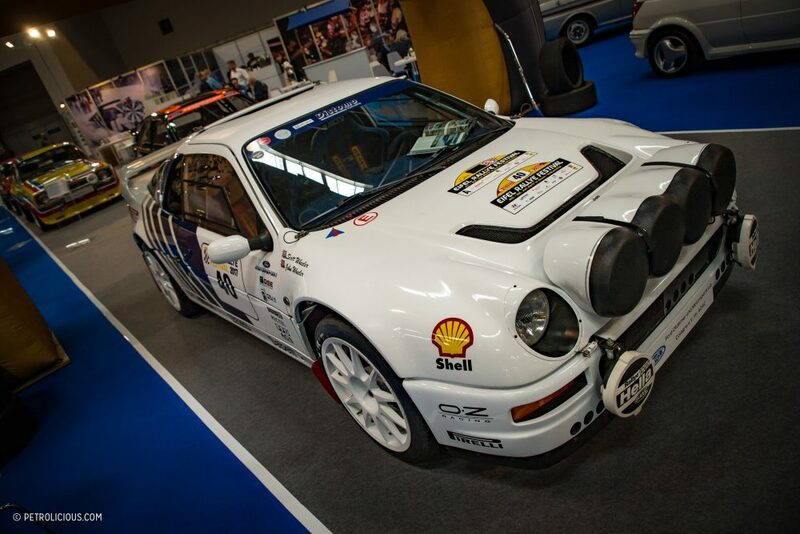 In 1996, the three-time Le Mans and three-time DTM champion drove this Team Zakspeed Opel Calibra in the International Touring Car Championship, taking seven wins. Unfortunately that was only good enough for 7th in the championship, although it was won by his Opel teammate Manuel Reuter. 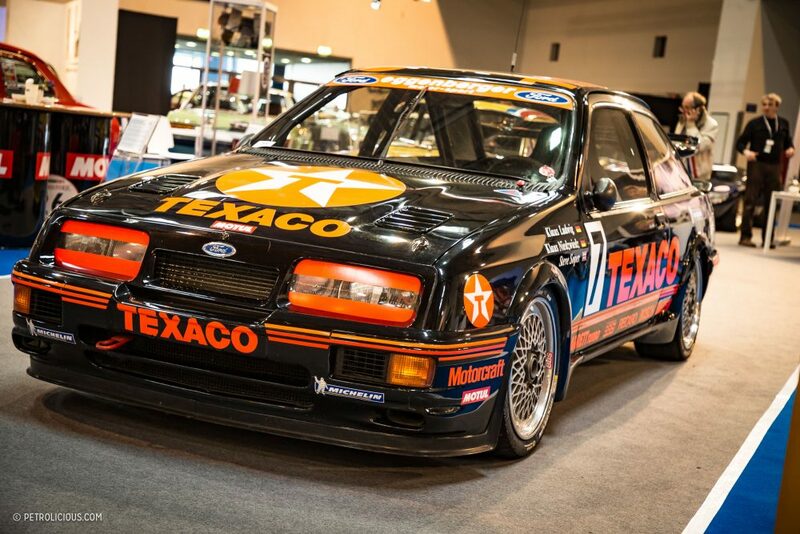 Speaking of Ludwig, One of my absolute favorite race cars as a kid was his Eggenberger Texaco-sponsored Ford Sierra RS500. I wore out my videotape of the 1987 Bathurst 1000, wherein this car, driven by Klaus Ludwig and Klaus Niedzwiedz, finished 2nd behind its sister car… until they were disqualified. 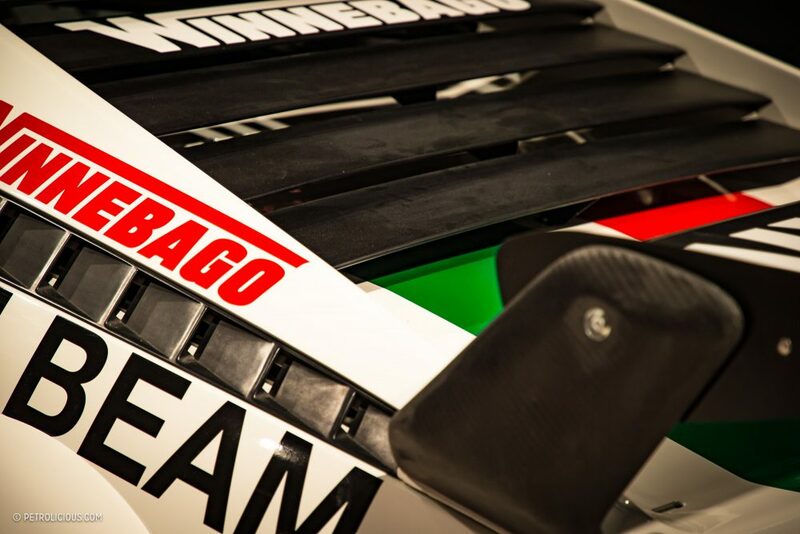 Ludwig and Niedzwiedz eventually finished 2nd in the WTCC, one point behind the BMW M3 of Roberto Ravaglia. 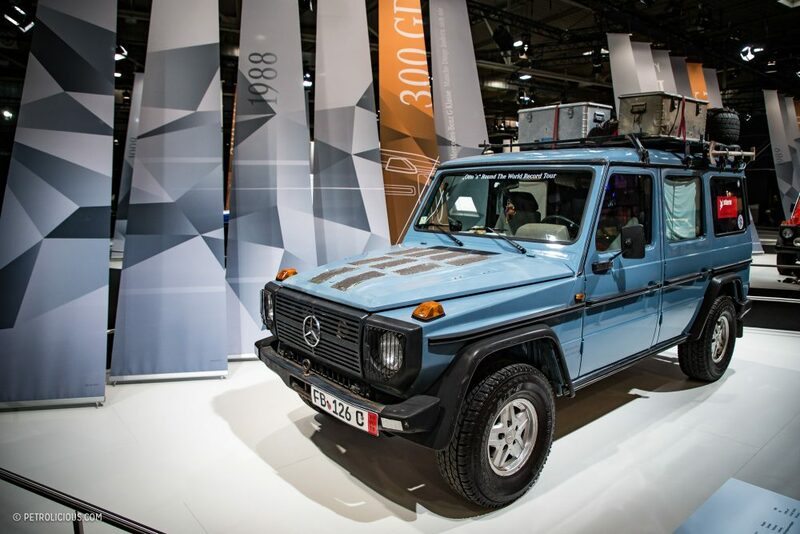 It might be a more understated vehicle in the scheme of the whole show, but this tired-looking G-Wagen actually has one of the most incredible stories. 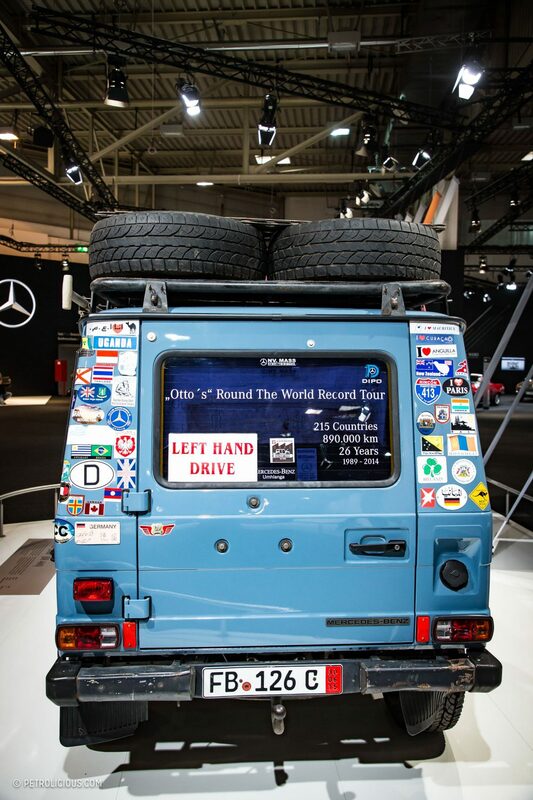 Owner Gunter Holstoff drove it to a staggering 215 countries over 26 years, making this the most well-traveled vehicle well, ever. 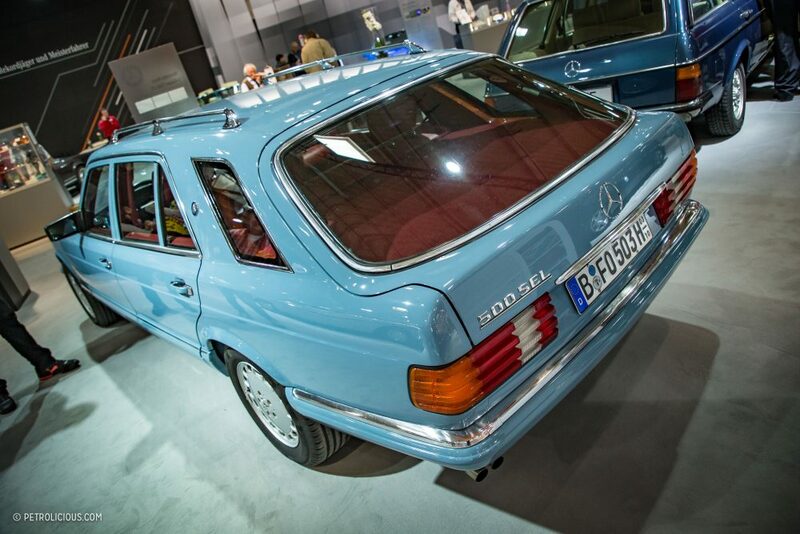 In contrast, a Mercedes with no such story. A very odd-looking 500SEL kombi that never made it out of the prototype phase. In 1984 the Race of Champions served to show the world just what a good driver Ayrton Senna was, as he beat a field of champions in a grid of identical Mercedes 190 2.3-16vs. 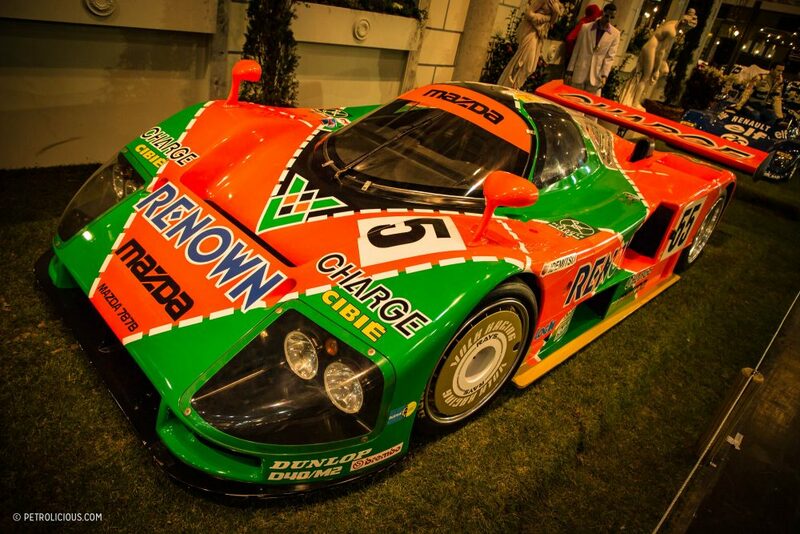 Niki Lauda, that year’s F1 champion, came 2nd to the great Brazilian in this car. 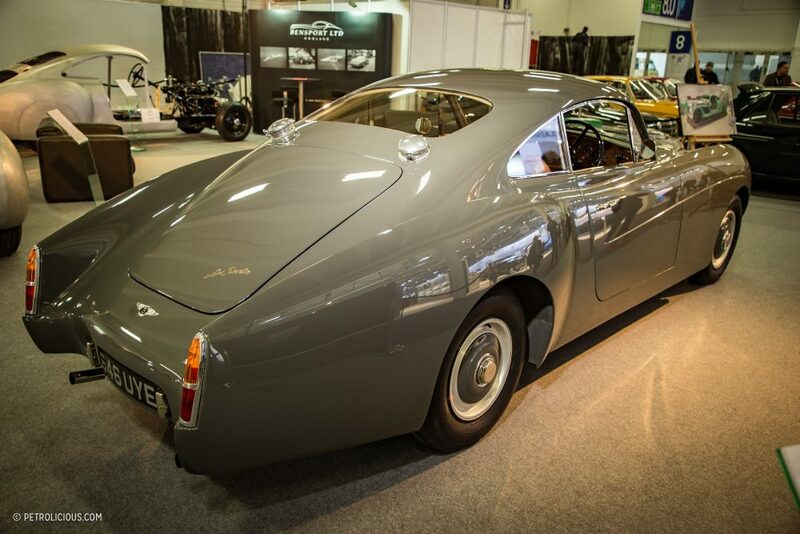 Astute Petrolicious.com readers might recognize this next car… seeing as we featured it last week! 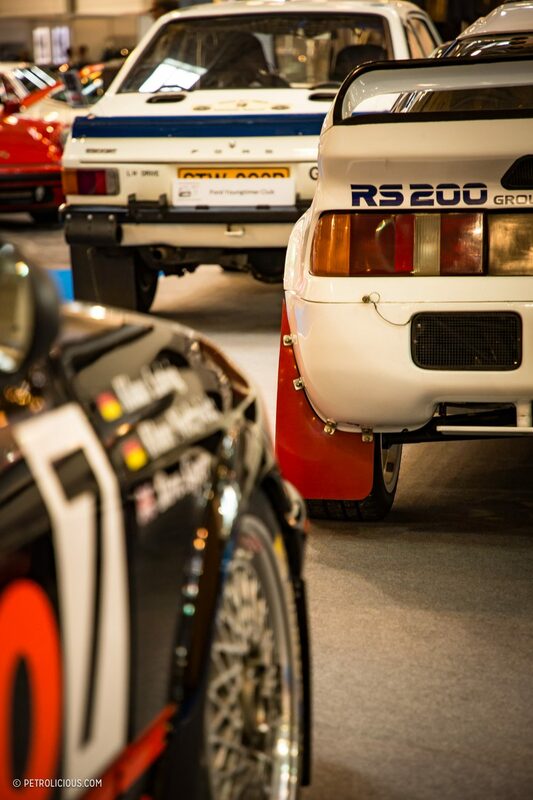 The Group S RS200 really is a special machine that took decades to finally complete to the correct standards. 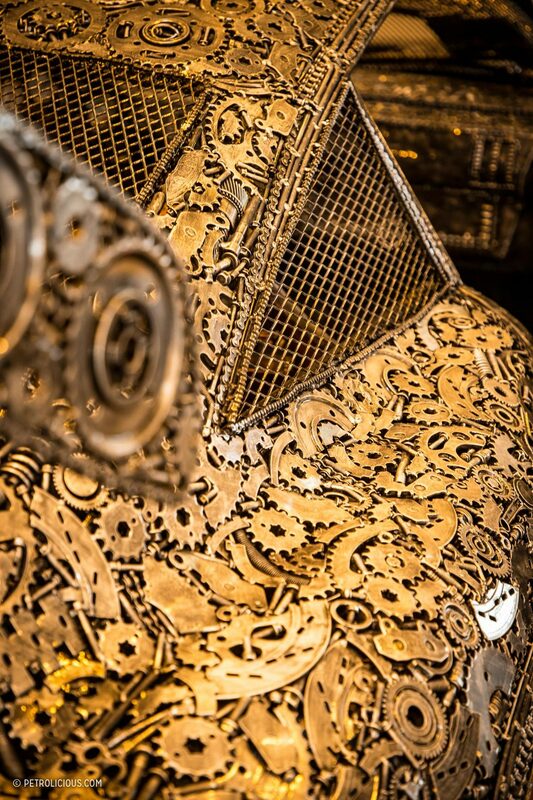 You can read all about that car and the build process here. 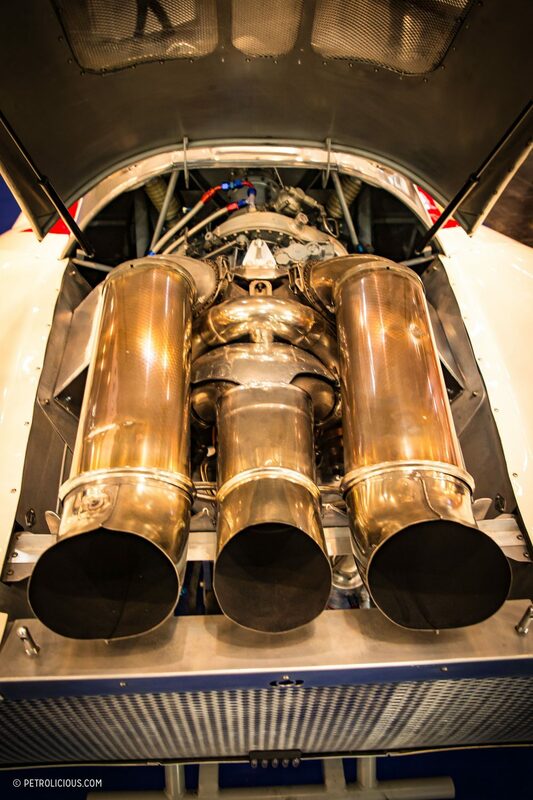 At first glance it looks a little like a Porsche 906, but the three huge exhaust pipes sticking out of the back warrant a little more investigation. Trying to reduce the speed that sports cars had achieved in the 1960s, engine sizes were reduced. 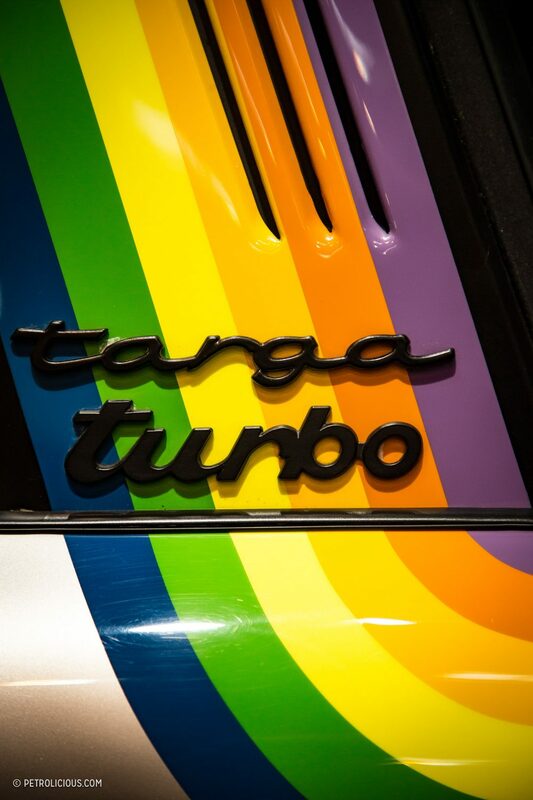 In the days before turbos really took off, that was a bit of an issue for American race car designers who almost exclusively used large-displacement V8s. 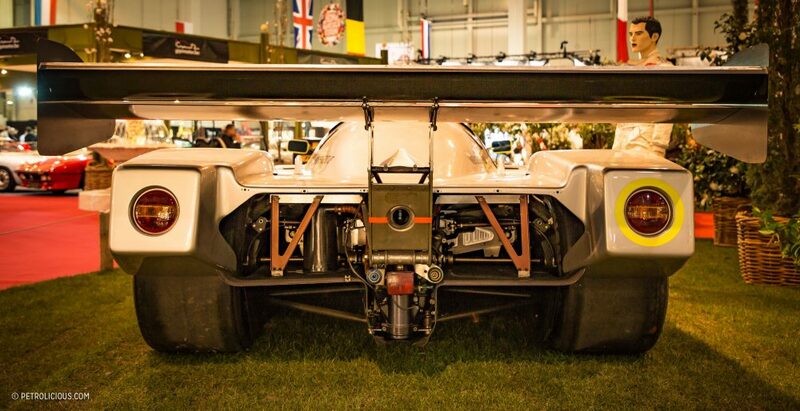 So why not build a car with no gearbox and a turbine engine that revs up to 65,000rpm? 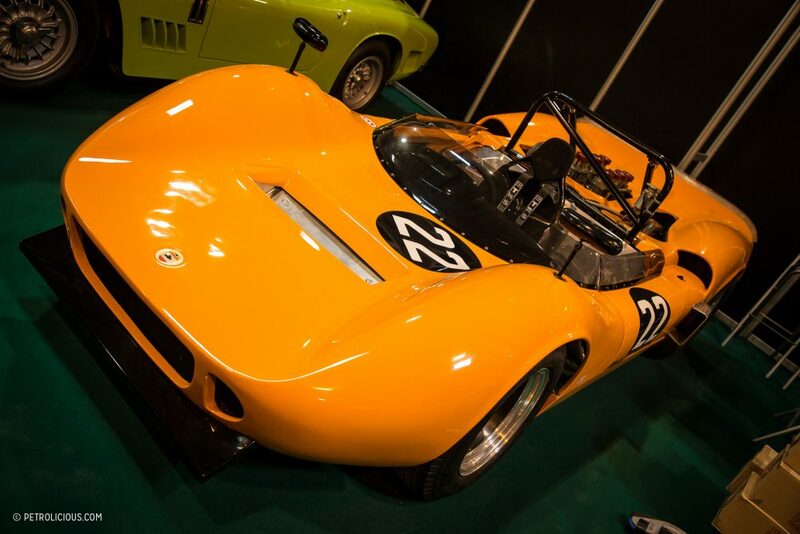 The Howmet TX is a special car that did just that, and definitely needs someone to make a video detailing its special history… Oh, wait. We already did! 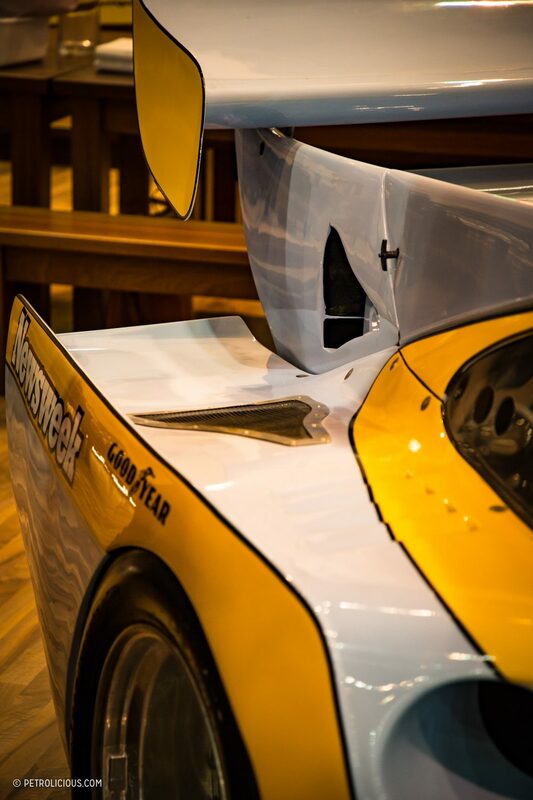 Last but certainly not least, DP Motorsport had a small booth in the main hall with a stunning F-body outlaw. 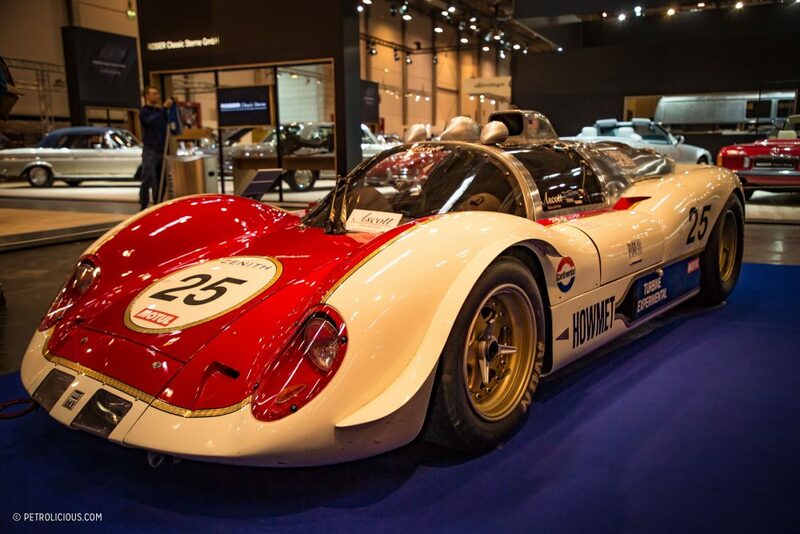 As mentioned above, the company’s founder, Ekkehard Zimmermann is the man responsible for the early Kremer K-cars, but also so much more. Like this lightweight hot rod that out RSRs the nastiest RSRs out there. 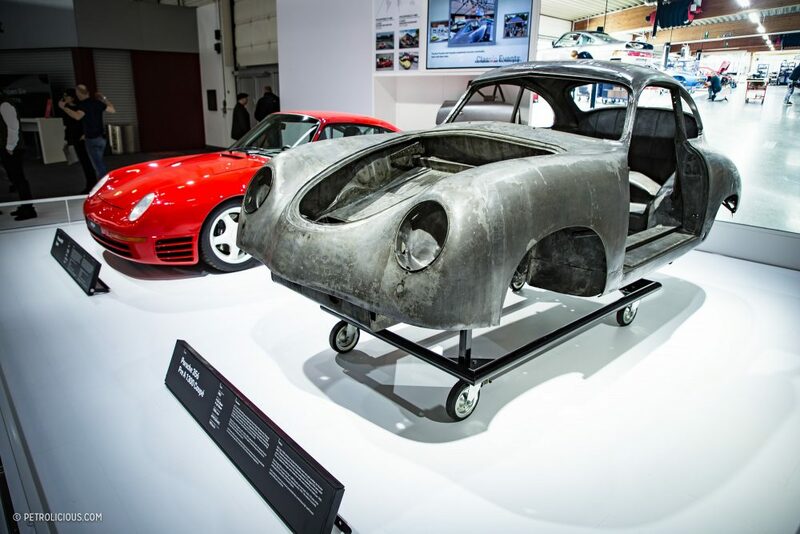 Forty years later with son Patrick at the helm they’re still making extremely lightweight cars, although the newest is a lot more subtle than some of their previous racing creations. 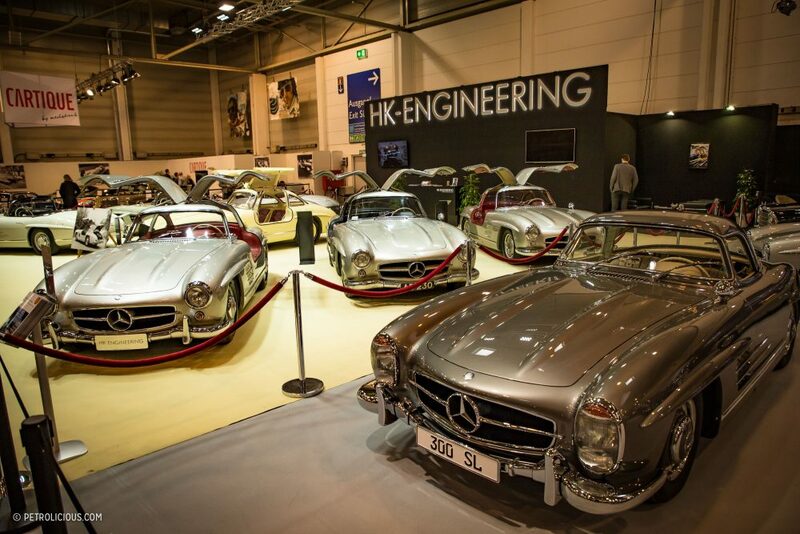 HK-Engineering is always good for ogling some extremely clean Mercedes, and there were plenty of things I couldn’t include here for sheer size alone. It turns out it’s hard to draw lines when there are literally thousands of cars to choose from. I got more than my exercise walking around the show, and I hope this gallery offers a good taste of what you can expect if you attend in the future. 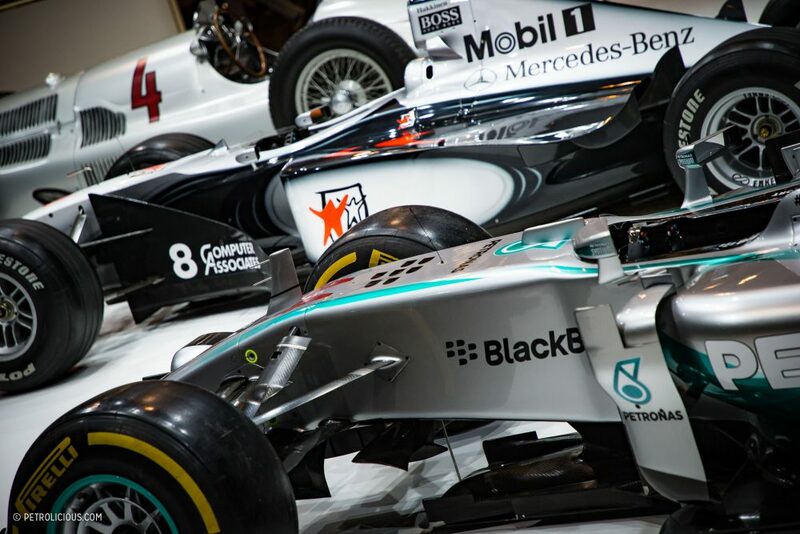 That Sauber Mercedes C9! One good looking race car! Why didn’t I learn all these interesting things in School. 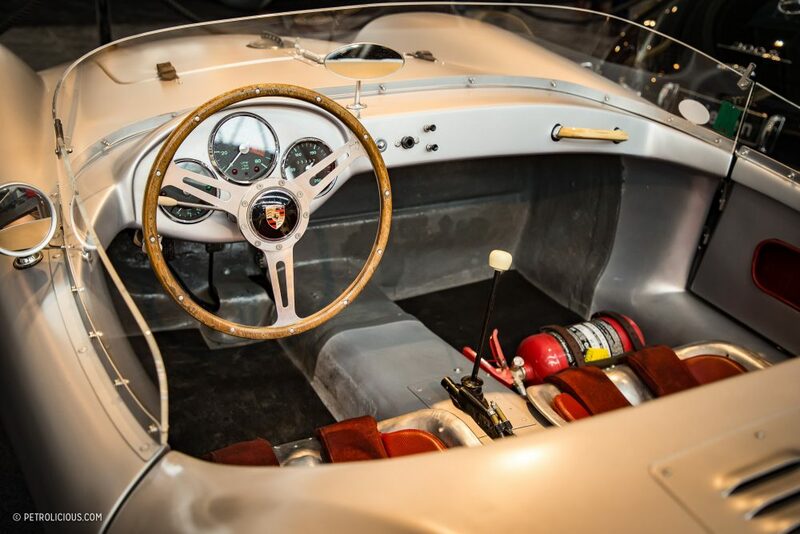 When it comes to interesting automobile content, Petrolicious is no doubt on top. 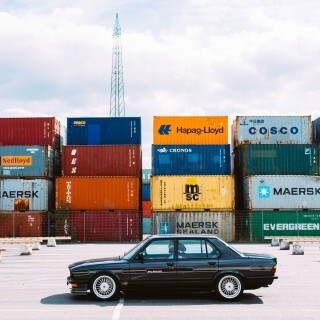 Great Work Petrolicious. Am a big fan. Amazing inventory! 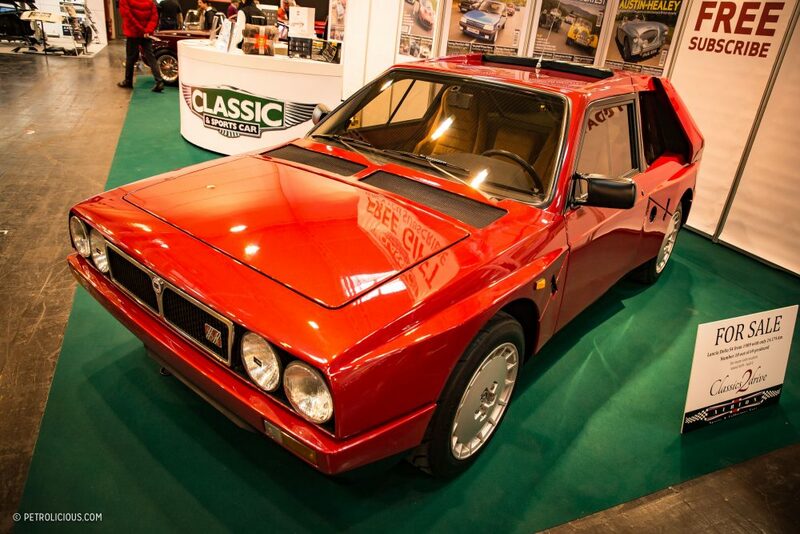 In the T-A 200 Quattro, is that the exhaust routing across and through to the door side exit?